On your wedding day chances are you don’t want to worry about a thing. You want to show up, have a magical day surrounded by loved ones and leave married to the love of your life! Myself and Lilly, my second shooter have a particularly special role in making sure your day is preserved and documented in the most loving, energetic and reflective way. We take your wedding day serious so you don’t have to. You can sit back and enjoy everything knowing you have an incredible photography team capturing all the moments! I always arrive 30 minutes to an hour early so that I can scout the venue, eat my snack while looking for amazing photo spots for later in the day. I also make a stop by the bridal and groom suites, say “hey” meet relatives and friends and grab my gear to start setting up. I always ask my brides and grooms to have ALL details in a box or bag so that when I get there I can grab it and start shooting. 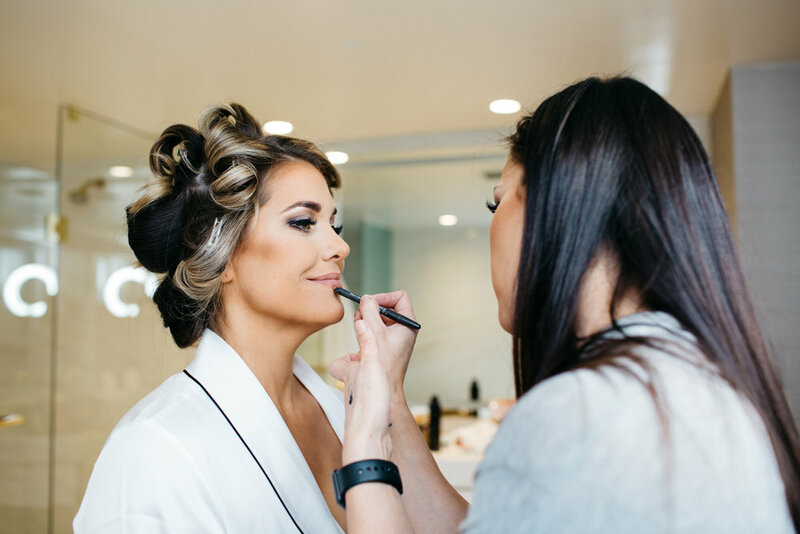 I like to get the bridesmaid robe shots when everyone has completed hair, makeup and had their lips touched up. This takes me about 5 minutes to capture. From there I ask my bridesmaids and mom or present guardians to get into their dress. Once everyone is dressed I ask a relative, usually mom or friend my bride has chosen to help her into her dress. This is where we get those gorgeous “getting ready bridal shots”! and space for guys to be guys (which usually yields the best candid photos!). One of my favorite parts of the wedding day is when the bride and groom are surrounded by their closest friends. Their truest selves are revealed, and it’s the perfect opportunity to capture their love as a reaction of those who surround them. I work quickly to ensure everyone has a fun time, but I work closely with my second photographer to ensure we capture a mix of portraits and candids to diversify the wedding day portfolio. Let’s face it: family photos on a wedding day are likely the least favorite and the most stressful...but they are also some of the most special photos for clients. Family photos aren’t just special they’re priceless. The defining moment for photographers on a wedding day is the ability to create photos we’re proud of, photos we’ve dreamt of in our minds and can’t wait to bring to life. However, I’ve documented weddings where I had an hour alone with the couple...and other weddings when I had 20 minutes alone with the couple. Regardless of the time disparity, it’s important for me to have a mental outline of photos before I even press the shutter. The more time I have, the more creative I can be, but this is a foundation I lay to ensure my clients have a strong representation of their first day as husband and wife. My adrenaline pumps the fastest during the ceremony. It’s the sometimes tenuous pinnacle of a year’s worth of planning, a series of singular moments (umm, no, the bride and groom cannot replicate their First Kiss! ), and a lot of stress. It’s my job to stay calm and focused, setting the foundation for quickly documenting the details, then pouring my energy to shooting the ceremony in a photojournalistic way. Every wedding day is different, but the majority of my clients opt to see each other before the ceremony (which I love and am extremely thankful for). In light of this, it gives me the opportunity to document the cocktail hour when otherwise it would be missed if I had to shoot after the ceremony for a prolonged period of time. I’ve discovered this time of day is perfect for candid photos and natural documentation of guests mingling, having a great time. Most of the planning a bride does is for the wedding reception. The food they’ll eat, the music they’ll dance to, the cake they’ll cut...all of these details need to be documented, because after the flowers wilt and the champagne disappears, photos are the only things that remain. In light of this, I educate clients on the time I need to carefully document details prior to guests entering the reception location. The rest of the evening will be spent enjoying the fruit of my clients’ labor, so I simply focus on documenting photos that embody the overall experience of the night. This portion of the list outlines the planned photos from the reception, but intentionally omits listing party/dancing as part of it. Because, well, dancing is dancing, and during this time of the night, I simply shoot from the heart. And dance a little, too. There aren’t any rules, just photograph people having a great time, capture the traditions and you’ll be covered. Important: I only get these awesome cocktail details with a second shooter! Because during cocktail hour I am with the bride and groom doing portraits. Creative sendoffs have become a popular cherry on top after a wedding. Whether you do sparklers or confetti, each send off can be magical. But with each type of send off there are pros and cons I can talk to you about so we can find the best way to photograph yours. Having a clean place to get ready is important. Whether you are getting ready at an Airbnb or hotel room or even your own home, less clutter is ideal. Having bags of food, soda cans, clothes, bags and other items laying around can be distracting in the background of all your photos while you’re getting ready. Having a section where purses, food and other items can go is excellent. Having the bride get ready by a window is great too! Keep any trash and fluff away from the area you will be getting ready in and the area where you will put your dress on. I always tell hair and makeup to be done an hour and a half before I really need them done so that we can start photos on time. I have a lot of respect for the hair and make up vendors. That is their craft and they want to make sure it’s perfect. Sometimes that means cutting into our photo time. So having them finish early doesn’t hurt and allows us to get more photos in while you’re glammed up. Renting Airbnb’s is the PERFECT option for getting ready photos. I have seen some neat historic homes where my brides and grooms get ready in. I suggest choosing a home with big windows and a lot of character. Some of the coolest getting ready shots were at Airbnb’s. Hotel rooms get cramped with a lot of people coming in and out. Having a whole house to spread out in helps with the clutter and traffic. Wear flats to your bridal session but bring your heels for the photos. Most likely there will be some walking involved and you don’t want your shoes scuffed up or sore feet afterward. But some brides choose to wear them the whole time to break them in, that is totally okay too! Grooms are typically simple… keep them fed and entertained until the party starts. One thing I love to see when I go into a groom suite is some form of entertainment. Whether it’s a playstation hooked up to the venue tv, dominos, cards or checkers, it’s always fun to get the candid shots with the guys. Having whiskey or your drink of choice is fun for the cheers photos too! Please don’t hit the golf course days leading up to the wedding or wedding day morning… I’ve had grooms show up with a bad sunburn and raccoon eyes from their sunglasses. The obvious first is that I can’t be in two places at once. On your wedding day there are so many wheels turning through out the day it is important for me to have Lilly or another fellow photographer friend photographing what’s happening on the other end of the building or city. Some of my couples decide to get ready at two different locations. As the lead photographer I spend almost all of my time with the bride through out the day, so having my second shooter with the groom is great! You end up catching some great “bro” moments. Not only do my second shooters capture the groom and groomsmen but they are there to get final reception details while I’m at the ceremony location doing family portraits. They can capture cocktail hour while I am working on portraits with the couple. They are an extra hand and eye when I need to style you during the your couple portraits. During the ceremony, having my second shooter focus on the groom and his reaction when their bride comes down the aisle helps a ton! If I don’t have them I have to pivot back and forth between bride and groom. It’s easy to miss a moment that way. And you just end up with more photographs all together. Overall I 150% advise couples in getting a second photographer. Most of my collections include them now because it is just overall a better day with one. 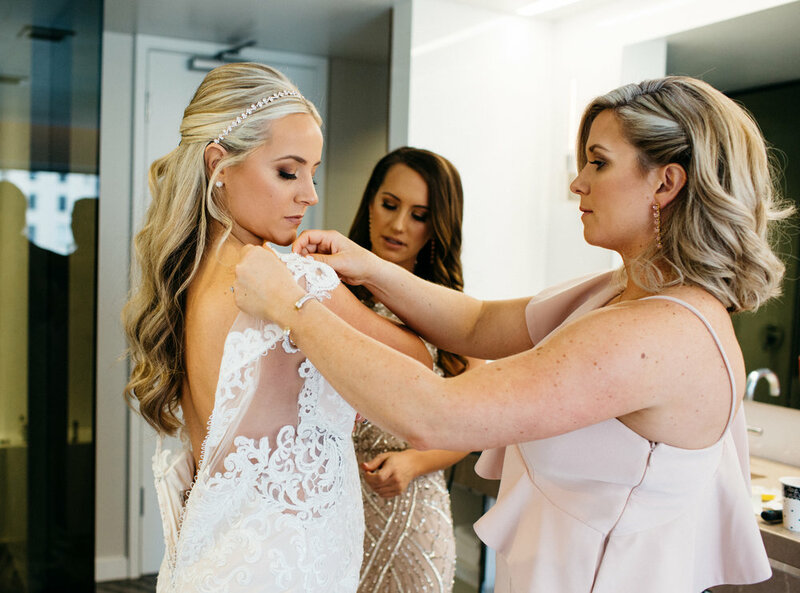 SO, this one is a tricky one because we have some wonky traditions that are just now beginning to fade out… but some of my couples families are still crazy about seeing the bride before the ceremony. Ultimately it’s your day, you do what makes you happy but I will tell you why having a first look rocks! For starters you end up with way more wedding party and couples photos in daylight. DAYLIGHT IS EVERYTHING! Part of the reason you are choosing me to photograph your wedding is my use of light and style. So day time photos are crucial especially if you have a wedding after daylight savings time in the cooler months. The sun sets early… Most of my ceremonies end with only 15 minutes of day light to spare in the cooler months. SO when this happens and we don’t plan on a first look all of the really important photos are done with a flash, it’s dark out and it’s overall less flattering. Having the first look before the ceremony allows us to get all the fun bridal party photos in before the ceremony, couple portraits before the ceremony and immediate family photos done BEFORE the ceremony.It’s AWESOME! This allows for me and the couple to pop away for a few minutes for sunset photos then they get to join in at cocktail time. I mean you picked out all these amazing drinks and finger foods you want to enjoy them too! More times then none if a couple decides they don’t want a first look they miss their entire cocktail hour taking portraits at the alter and get fewer couples photos. This is why I always recommend them especially if you have a wedding in the cooler months! BRIDAL TIP: see when the sun sets at your wedding and base your ceremony on that verse when people typically have their ceremony time.